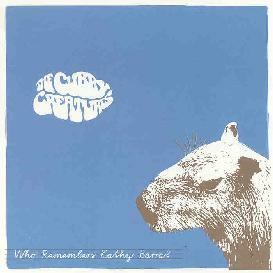 The Cubby Creatures - "Who Remembers Kathy Barra?" Ok, the stuff that I did not like about this EP first - the title track bugs me, it's an apologetic/tribute song about a girl that the writer teased (by calling her a capybara, a large rodent from South America. Kids, I swear they can be so mean!) when they were younger, and I just didn't find it especially amusing or musically interesting. Hey, it happens. Also, I could do without the between song spoken stuff, like most between song filler it's ok on the first listen but after that it rapidly becomes distracting. Other than these qualms, there were several songs that I quite liked. "Knitting Bee" is a catchy slice of Beatles-esque pop that brings the Olivia Tremor Control to mind, and both "Diseases" and "Samy" remind me of the oddly structured avant pop of the Monks of Doom or Camper Van Beethoven, complete with some nice violin, and clarinet accompaniment. The final track, "Bean (Is Just a Super Rodent)" is a return to the goof inside-joke humor of the title track, but I found the song to be more interesting. There are a couple of little short songs that are not titled (at least as far as I can tell) that are almost fragments, but sound pretty cool. Overall the vibe of mid-eighties college rock is very strong here, and that's not a bad thing. For more information you can visit The Cubby Creatures web site at: http://www.cubby.net. Contact via snail mail c/o Cubby Control; 1172 Florida St; San Francisco, CA 94110.